Lumps - The projections extending downward from the breech end of a side-by-side gun. Into the lumps are machined the hook (the concave semicircular cut in the front lump, to swivel around the hingepin) and the bites (the square cuts, to accept the locking bolts). Also called underlugs. Jointing barrels by the dovetail lump method - breech end view. 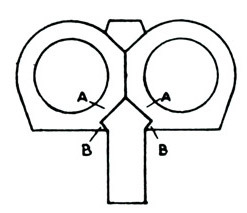 This is the most common method of jointing barrels. 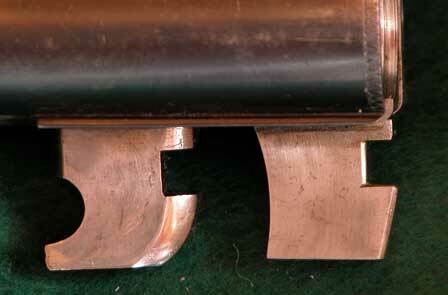 The lumps are dovetailed and brazed (or silver-soldered) between the two separate barrel tubes. Drawing from Major Sir Gerald Burrard, "The Modern Shotgun".